Sometimes, I can’t believe this is how my story goes. Meaning the way my life is at the moment with where I am as I continue to get well from cancer. Within that realization my mind is like on mourning mode and sometimes I get lost in it… Then, last night I dreamed I was at war and I realized how my war within lies. There is and has been for awhile in my life, a war going on within and as me. This war I started against myself when I was in my early teens. Pain seems to intensify my fears and so the war within me seemed to grow. So it’s strange but things got worse for me when the first of July of this year I added another intense alternative treatment therapy. The particular treatment I will speak more about when I’m able to – caused my physical body to take quite a hit, and unfortunately, in fear, I lost sight of the struggle my body was going through because all I could think to do in that fear was to keep pushing myself to do whatever I had to do,,, for however long I had to do it, so long as I get myself well from the cancer. The treatment brought with it consequence of physical / muscle deterioration and extreme physical pain, and, in my lack of awareness, I began taking more and more prescribed pain meds and muscle relaxants , as well as alternative methods in my quest to relieve the pain. Everything I was doing, it became to much for my physical body. Both my kidneys and my liver began to show symptoms of trouble – trouble from all the methods I’d chosen to help relieve my pain. I had no choice. I had to get off of everything and so a month ago, I did. I stopped taking all the prescription pain meds and muscle relaxants and ibuprofen. I also stopped all alternative methods I’d been using for pain as well. Now I use nutrition/foods/juice / Omega 3’s and herbal remedies only to reduce the inflammation. I also drink teas with hibiscus, passion flower, lemon balm, just to name a few of the many wonderful herbs and seasoning I use, like tumeric and even capsicum/cayenne pepper. I also stopped the intense alternative treatment method that I started 5 months ago. And with the assistance of some private interviews / tools that I was fortunate to receive through Eqafe, I’ve been able to easily stop the pain meds with very few side affects and have become effective in breathing through the fear when the pain comes and have been also been successful in my practice of directing myself to change who I am within the fear so as to forever release who I accepted and allowed myself to be within the fear to where I am able to redefine in awareness who I am within and as my physical body when the pain come. It’s interesting, because I’ve been experiencing less pain as I’ve become more aware of who I’ve been within my accepted belief of myself as my mind to one where I’m understanding that those beliefs about myself no longer ring true to who I am directing myself to be and become as my physical body/ mind and being. Within this forgiving myself comes and that is for sure something one can become successful in doing, forgiving oneself. My Eqafe personal interviews have also assisted me in becoming aware of how in my pain/fear over the course of 5 months, I created some automated pain patterns. Yeah.. But then after coming off all those pain meds, I’ve also been able to develop an awareness of how often my mind will tell me the movement that I’m about to do – like getting up to go to the bathroom for example – is going to hurt like hell, when in fact, when/as I stop the thoughts/fears, and focus on my breathing while I make the move, it actually doesn’t hurt at all. Sounds crazy I know, and it is crazy, how easy we can create patterns. Therefore, it’s best we learn how to create the patterns that will assist us to live our utmost potential and thus begin to be able to assist in creating a world where All Life can live their utmost potential. Within the automated patterns, I’ve also created pictures of myself within my mind. and these patterns I continue to investigate and are part of the war within my dream last night. I will be sharing more on this in blogs to come. At the moment, I am here, focusing on substantiating my physical body. Beginning with committing myself to make sure that every single day I give my body what it requires nutritionally to repair and recover and heal. I commit myself to walk in breath and awareness as I consistently nourish my physical body to the best of my ability, and to redefine and become a living expression of the word relax within and as my physical body as I continue to walk my story, my Journey to Life. Day 294: You Can have your Apple and Eat the Seeds too! – Day 2: How Rational is your Fear? Day 293: Wait, you can’t enjoy that, you have Cancer! 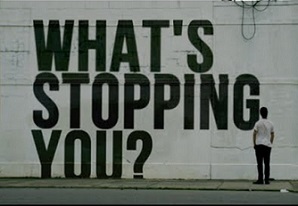 – Day 1: What’s Stopping You? Sitting here to write about this particular emotional fear energy isn’t something that I want to do. In fact, I’ve become very good at avoiding this point all together by way of one distraction after another until wham! Seemingly out of nowhere I will experience more pain in my upper back / chest area and that pain seems to trigger an experience of emotional fear energy. Where I would become so influenced by the energy that I wasn’t able to see what was contributing to and thus creating the thing in the first place. When I’m in that emotional fear energy, it’s like a dark wave comes over me and within that the personal realization and seriousness of my situation comes to surface. My situation being that I have Cancer, and that it may very well be the thing that kills me. When I was first diagnosed with Cancer, almost 2 years ago, that was when this particular Emotional Fear Energy pattern was ignited, or more appropriately, that’s when it was first triggered. And I mean, I’m sure we all have this pattern within us and will have to face it because I mean everyone will face their own mortality at some point. So how can one assist and support themselves to stop this particular emotional fear energy? This I will be sharing assistance for with this blog and blogs to come. I knew from the beginning when I first made the decision and firm committment to myself and my physical body to get well and become Cancer free through alternative means and diet and I knew I was beginning what would be a long journey. So, I’m still applying the same alternative treatments that I planned almost 2 years ago and they’re still proving to be very effective. My Physical Body is responding very well in that the Cancer is still diminishing. But even still, there’s no way of knowing for sure the toll that all of it will have on my Physical body, or even if it will ultimately help me to be Cancer free. So what’s been going on is for almost 2 years I accepted and allowed this particular emotional fear energy pattern- that I can only describe as debilitating – to be the reason why I reach for things to distract myself from what’s really go on within myself, and instead, what I do is sort of freeze inside,which is really a way of suppressing myself. I also go into a waiting game within myself as if I’m giving up on myself. Alright so, when I participate in and as this particular emotional fear energy I’m not able to see what it is attached to. The only thing I know for sure is with the energy comes a sinking feeling in the pit of my stomach. Tears will some time swell up, and sometimes, I allow myself to cry, and it’s a deep hard cry. But mostly, I stick to distracting / suppressing myself so as to not look at / investigate what the fear is really attached to. So the Eqafe interfiew that I heard called: Incurable Diseases – Fears & Phobias, resonated with me and assisted me to realize what’s been going on within me which is a Fear of Losing Control. Identifying this one thing has assisted me to better understand what’s been contributing and creating the emotional fear energy which and has assisted me with a clearer perspective, which causes the energy itself to lose it’s illusion of control and power over me. Before, when the energy would be triggered, there was no sense to be made of it, so it was as if I would sort of tumble into and as the energy and become fully engulfed in my imagination and basically interpret my fear experience as that of fearing death and dying. So to Stop Emotional Fear Energy one must first be able to define what one is fearing and when one can do that then one will be able to begin to direct oneself to stop the control the fear had on oneself. And for me this is huge! Because I mean since being diagnosed with Cancer, I’ve seen some changes that my physical body has gone through. And within that are the realization that any day the Cancer could spread and get worse and, what will I do if that happens. and what if my body begins the process of dying’? Will I be aware of it if / when that happens? Will I ultimately lose the use of my bodies facilities? And can I overcome embarrassment if that were to happen? Will my body become ugly or deformed in some way, and if so, will my partner still want to be with me? So to be clear, I’ve been able to identifytjat the fear is about what my physical body will have to endure and so what I will have to endure with regards to the physical process of dying. Any deterioration process. The decay, the physical pain and suffering, any and all experiences that my physical body may go through – that’s what I’m referring to, that’s what I fear losing control of. And now that I’ve been able to identify this point, I’m already seeing my ability to stop accepting and allowing the emotional fear energy to overpower me. I’m also investigating how I’ve accepted and allowed ‘avoidance’ and ‘despair’ to play a role in me not having the endurance to stand up to this fear of losing control which itself leaves me with the illusion of an inability to direct myself effectively to forgive and release myself of the emotional fear energy experience. More on these in blogs to come. I forgive myself that I have accepted and allowed myself to attach emotional fear energy to having Cancer. I forgive myself that I have accepted and allowed myself to in my mind attach the word cancer to emotional fear energy. I forgive myself that I have accepted and allowed myself to attach the effects of cancer on my physical body to the emotional fear energy within and as my mind. I forgive myself that I have accepted and allowed myself to not see, realize and understand that to accept and allow myself to go into emotional fear energy is doing the very thing to myself as my Physicalbody that I am fearing the cancer will do. I forgive myself that i have accepted and allowed myself to compare my cancer story to those who have survived their cancer story. I forgive myself that I have accepted and allowed myself to be influenced and unmotivated by the emotional fear energy that I have associated with having cancer and with which I have accepted and allowed myself to give in to causing myself to want to give up. I commit myself to when and as I see emotional fear energy come up in relation to cancer and what having it might do to me, I stop. Instead I direct myself to Breathe and focus on remaining realistic with regards to any and all fears and / or symptoms that may come up from moment to moment and to Not compare my cancer story to those who have survived cancer and to understand that in reality the process of alternative cancer care will have physical symptoms and/or reactions that are Not life threatening and are only a part of the healing process. I forgive myself that I have accepted and allowed myself to go into emotional reactions within the ‘giving up experience‘, where I’ll become easily irritated and impatient which causes resistance within me which I often allow to influence my relationships in how I respond and interact or react to / with others, as well as with myself from the starting point of the irritation and / or impatience. I forgive myself that I haven’t accepted and allowed myself to see, realize and understand that ‘giving up’ is a process that manifests within and as my mind as consciousness and for accepting and allowing myself to beLIEve that it is me who is making the decision to give up, when in fact the decision to give up began the moment I first resisted and / or reacted to a part of myself within my mind and for that moment when I first turned against myself in my mind which is the exact moment when I gave up. I forgive myself that I have accepted and allowed myself to give in to emotional feeling reactions / energies, which give way for consciousness to make the decision for me to make the giving up official. I forgive myself that I have accepted and allowed myself to so easily and readily give up on myself and for how I look to find something wrong in things and / or for looking for something somewhere to judge and attack myself or others for. I commit myself to when and as I see myself being pulled into and as irritation and / or impatience and / or resistance within the emotions of the giving up experience, I Stop, I Breathe and move myself to do whatever I can to assist myself – such as writing out what’s going on within me in that moment and / or by taking a short walk or playing fetch with my dog – rather than giving in and accepting and allowing myself to be pulled into and as my mind as ‘the giving up on myself experience‘. I commit myself to when and as I see myself reacting within my head towards myself, I stop and breathe, I direct myself to in that moment do self investigation to understand my relationship with the point of giving up so to assist myself to walk through the point with stability – instead of reacting and judging myself and building up more emotional and feeling reactions which lead to consciousness making the decision for me to make the giving up process official. I commit myself to stop giving myself over to my mind within and as the giving up process / experience – to instead investigate the thoughts / voices in my head that I’ve been listening to and the emotions / energy that I’ve been participating in that have turned me against a part of myself in my mind and within that for using entertainment / television as a tool for my mind to fuel itself – to instead use the mind consciousness system to work for me instead of against me in remaining aware of how in that moment of giving up, look at how / why I’m being so hard on myself with regards to this exact point, and how in doing so it further builds a hardness within me, a wall, wherein I’m not able to recognize my own potential, therefore, I commit myself to write out, investigate and identify the mental and physical effects of the giving up process and to practice embracing myself as I continue to walk this process while assisting my physical body to correct imbalances and heal itself. I commit myself to recognize and appreciate myself for remaining consistent within the process of assisting and supporting myself, my physical body to heal itself of cancer. This entry was posted on October 29, 2014, in Uncategorized and tagged 'entertainment', addiction, addictive behavior, alternative cancer treatment, alternative treatments for cancer, AMA, American Society of Clinical Oncology, belief systems, bernardpoolman, big pharma, binge-watching, brain fog, breast cancer, Breast Cancer Research, Cancer, Cancer 'cure' research, cancer research, cathy krafft, charity, chemo brain, Clinical Trials, collaborators, Crimes against humanity, criminals, desire, Desteni, Desteni I Process, disease, Dr. William Donald Kelley, drug cartel, drug companies, Drugs for Cancer Treatment, E. Richard Brown, elitism, energy, fatcats, fatigue, FDA, FDA approval, Fear, federal funding, Follow the money, giving in, giving in to the mind, giving it my all, giving up, giving up on myself, good intentions, government, greed, justification, life threatening illness, manipulation, medicine, mind consciousness system, mind control, one answer to cancer, organized crime, pancreatic enzyme therapy, pharmaceutical industry, physical reactions, pink ribbons, possessed by the mind, possession, poverty, preprogramming, Profit, reacting to my own mind, reactions, reasons, relationships, scams, self honesty, self sabotage, sinking feeling, spoiled rotten, struggle, sunettespies, the Elite, the poor, the rich, toxic, toxicity, WHO, World Health Organization, World Without Cancer. I forgive myself that I have accepted and allowed myself to be manipulated and controlled by a sinking feeling within the pit of my stomach, where who I am as my mind, as consciousness, seems to pull me into an abyss of sorts, a dark hole within myself wherein I have no motivation and where nausea and fear makes me want to give up before I’ve even given myself the opportunity to get started, therefore, I forgive myself that I have accepted and allowed myself to be sucked into my mind which then pulls me away from my physical body / reality and living. I forgive myself that I have accepted and allowed myself to become possessed with the energy experiences I have in relation to myself and the challenges I’m facing with regards to having breast cancer. I forgive myself that I have accepted and allowed myself to underestimate how the mind uses entertainment to control and manipulate and keep one locked into and as the very fear of facing and giving up on one’s self with regards to whatever it is one is resisting to look at / face / change about oneself. I commit myself to Stop using entertainment / television as a way of allowing myself to be drawn into and as my mind – which then initiates a sinking feeling and then the giving up process – instead, I commit myself to make the decision to immediately pull myself back into the here, to remain stable within and as my physical body. I commit myself to get out of the energy and give myself the opportunity to be here within and as my body, to see, realize and understand that I am able to stand up and direct my world and my reality. I commit myself to whenever I’m facing a difficult moment, where I see that I’m experiencing physical reactions – that come with the type of treatments I’m using – I stop, I breathe, I direct myself to remain aware of what’s going on within me at that moment, to Not fear the sinking feeling, and to instead look at what’s going on within me and speak the words ‘I am here’, to assist myself to ground myself back to an awareness that is aligned within and as my physical body and physical reality. I commit myself to when and as I see myself facing a challenge where I become nauseous and experience a sinking feeling in the pit of my stomach, I stop, I breathe, I see, realize and understand that in that moment I’m being shifted into and as my mind, so when such a moment of energy occur, I commit myself to shift myself back into and as my physical body and reality and to take the moment to look again at the solutions that I’m using to solve my particular problem / challenge that I’m facing. This entry was posted on October 28, 2014, in Uncategorized and tagged 'entertainment', addiction, addictive behavior, alternative cancer treatment, AMA, AMA Council on Drugs, American Society of Clinical Oncology, bad results, bankers, belief systems, bernardpoolman, big pharma, brain fog, breast cancer, Breast Cancer Research, Cancer, Cancer 'cure' research, cancer research, Cancer Therapy, Cancer to become No. 1 killer in US, cancer treatments, Capitalism in America, cathy krafft, charity, chemo brain, Clinical Trials, collaborators, Crimes against humanity, criminals, desire, Desteni, Desteni I Process, disease, Dr. William Donald Kelley, drug cartel, drug companies, Drugs for Cancer Treatment, E. Richard Brown, elitism, energy, fatcats, FDA, FDA approval, federal funding, Follow the money, giving in, giving it my all, giving up, good intentions, government, greed, half assing, justification, life threatening illness, manipulation, medicine, mind control, money, one answer to cancer, organized crime, pancreatic enzyme therapy, pharmaceutical industry, physical reactions, pink ribbons, plop myself in front of the t.v., possessed, possessed by the mind, possession, poverty, Profit, reasons, relationships, scam, self honesty, self sabotage, Sloan-Kettering, Snapping Out of Possession, spoiled rotten, struggle, sunettespies, that sinking feeling, the Elite, the poor, the rich, toxic, toxicity, watching television, World Without Cancer.